Note: This post is second part of this series about how a reader created a corpus of almost Rs 4 Crores in just 10 years. Like the first part, even this part is worded by Ajay Sreenivasan – a loyal reader of Stable Investor. And if you haven’t read the first part, please do so immediately (Part 1) before going ahead with this post. In this part (2nd), he reflects back on his experiences and shares his learnings…which can be used as broad guidelines by other mutual fund investors. I had a reasonably stable job and income. I had sufficient surplus to invest in markets & mutual funds. I had a habit of Saving. And it was not new and had its origin in times, much before I came to Gulf. Combined with this habit, I also had the Discipline to stick with it. Though I really started ‘planned process of investing’ quite late, I still had age on my side….and this always helps in allowing ‘Compounding’ to create its magic. Because of above point, I had a reasonable amount of time to achieve my targets. Since I had a decent regular income, I had a decent risk taking ability. 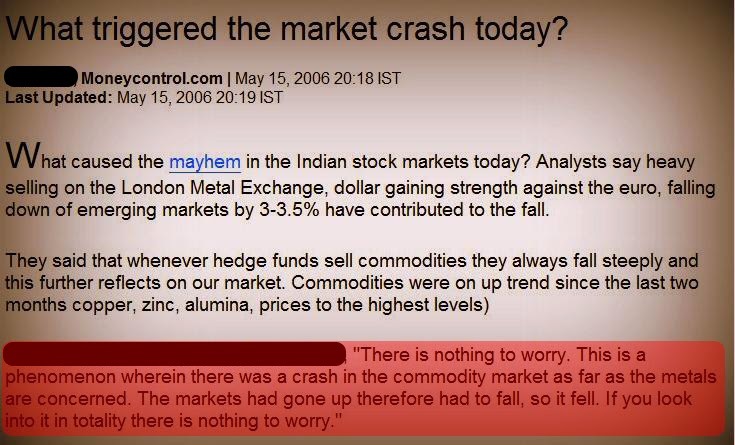 I was lucky to be part of markets which became extremely volatile at times. I was lucky to witness quite a few market crashes. Why? Because SIP works best if the markets are volatile and present the investors with many opportunities to invest ‘more’ at lower levels. This was a big advantage. I had no personal loan or housing loan to worry about. Another big one. I had already bought a home prior to investing even a Rupee…and luckily, I did it much before the real estate boom started. I was late to start investing. And I have seen people repent…and I mean really repent…when they realise that just because they were late to start investing by a few year, their final corpus was nowhere near where it could actually have been. I put most of my early savings into products which actually reduced purchasing power (read Insurance products). I was very late in creating a plan for investing. I should have done it almost a decade earlier than when I actually did it. I invested randomly without any goals, during the early part of my career. I started getting into direct stock investing, without having the proper knowledge of stock markets or valuations. At times, I went over board with my direct stock investing. I saved and invested as much as possible. And when markets were down, I invested more. Even though I questioned my own beliefs every now and then, I followed Systematic Investing diligently. I identified my mistakes pretty soon (in a few years!!) and started focusing on Mutual Fund investing…as this helped reduce chances of committing errors in direct stock investing. I got myself a financial plan and invested as per the plan (and with a purpose). I took adequate Term Insurance plan. And this in itself is a big factor, when you want to sleep peacefully at night, without having to worry about what will happen to your loved ones when you are not around. I realized and more importantly acted towards separating Insurance from Investment. I said no to ULIPs. I learnt the importance of Asset Allocation and acted upon it. Even though I had so many period where I could have panicked (and at times did) in last 8 years, I did not quit midway. I continued with my plans. I concentrated on investing the set investment amount (Monthly SIP x No of Months as per original plan)…sooner than bothering about the target amount. I cut my losses in direct stocks and re-invested the money in equity fund or debt as per the required asset allocation. I remained invested through out the period of 10 years. I invested only in well diversified Mutual Funds (max. 7) across fund houses. I chose Direct Plans as soon as it was introduced. I used Liquid Funds to park money when I had to transfer money to equity funds through STP (Systematic Transfer Plan). I made mistakes and learnt from those mistakes..and took the experience. I managed not to invest in real estate in the crazy boom of 2006 – 2009. But only time will tell whether I was correct or not. – Why should I even invest? – What am I investing in? – How will I get my capital back? – What return I will get back? – Will the return match inflation? – When do I need this money back? – Is it the right investment option for me? – What are the real possibilities of not receiving the capital or expected returns? – Will my asset allocation allow me to invest in this option? – And whether the current market valuations reasonable enough to invest in equity? Save as much as possible and start investing as soon as possible. And ideally, you should start investing from the very first day you get your first salary. If you are afraid of stocks and mutual funds, start by investing small amounts to gain practical experience of positive and negative portfolio returns. You might end up losing money, but experience gained will help you a lot when you plan for the big amount you want to end up with eventually. Have a plan. Even if you think it is difficult to achieve it. Having it is almost half the battle won. And if you cant make your own plan, get in touch with good financial planners. They will charge you money for their planning services. Don’t worry. You are ready to pay your doctors. Why not be ready to pay those who are looking after your financial health? Think about it. Invest whatever is possible towards your goals. And it seriously doesn’t matter initially whether its small or big amount. Just go and do it. Are you a regular person who goes to office and does not know much about stock markets? Stick to investing in mutual funds via SIP. End of Discussion. Inflation can kill you. Seriously. Always include a realistic inflation figure while making your financial plans. Its always safe to be on the higher side. High returns expectation can also kill you. And that is because you will start making buy/sell decisions in line with your expectations. Always keep reasonable returns expectations and accordingly, have your financial plans. Its always safe to be on the lower side. Have an asset allocation plan and follow it religiously. And unless the valuations become extremely compelling (like PE<14), keep 20% in debt. Any money which is not required for next 10 years or more, should be invested in well diversified equity or balanced fund. Remember this as this is very important. Any money which is required within next 5 years should be invested in debt instruments. If you have money which you need in next 5 years, please switch from equity to debt instruments as soon as possible. Always be ready to face short term notional losses. And remember that your returns could be Zero or Negative, even after 5 years (Remember 2009-2014). But over a period of more than 10 years, the general trend is Up. But even this is not guaranteed. Be happy and always welcome a market crash in the early stages of your investment journey. It will boost your return significantly in the long run. Invest some money whenever there is negative news all around and during panic selling to boost return. Always keep track of market valuations & your asset allocation. Set your own rules for asset allocation that suits you. Review performance of the mutual funds in your portfolio on an annual basis. And replace the under-performers after thorough analysis. Never replace a fund if it underperforms the benchmark for a quarter or two. You need more time (2+ years) to know whether its a good idea to move out of a fund or not. Avoid churning your funds frequently as it will not help you, but your broker or RM. And always choose funds with reasonable fees and direct plans. For choosing Mutual Fund schemes, always stick to reputed process oriented fund houses and evaluate funds based on all parameters. Don’t invest because your friend or relative is investing. Your risk and expectations will almost always be different. Mutual Funds are the best investment vehicle for retail investors. Only effort required is to choose a few good funds and invest in them regularly. Direct equity investing requires a lot of additional efforts. And these range from evaluating a company to regularly tracking it to finally, exiting it. In Mutual Funds, always invest in Growth options. If you require money, you can always withdraw. No point going for the Dividend option. Do not panic during bad times / bad news. And don’t get too excited in bull markets. Always stay calm. Make it a point to have adequate Term Insurance cover, from an early age. Also make it a point to have proper health cover and emergency fund to suit your needs. It only proves that there is no one who can predict what is going to happen in markets with 100% accuracy. So don’t waste your time in listening to these so called market experts who claim to have the power to predicts the market movements. A good mutual fund scheme named HDFC Equity’s NAV fell from Rs 134 on 1st May 2006 to Rs 112 on 1st June 2006. A big fall at that time. But today, no one even remembers the crash in the long term chart. The NAV of the fund is more than Rs 480. In January 2005, it was just Rs 67. NAV today has multiplied almost 7.5 times. There will be sudden market crashes in future as well. And fund NAVs will go down. And down to almost any level. Accept this fact and move on. 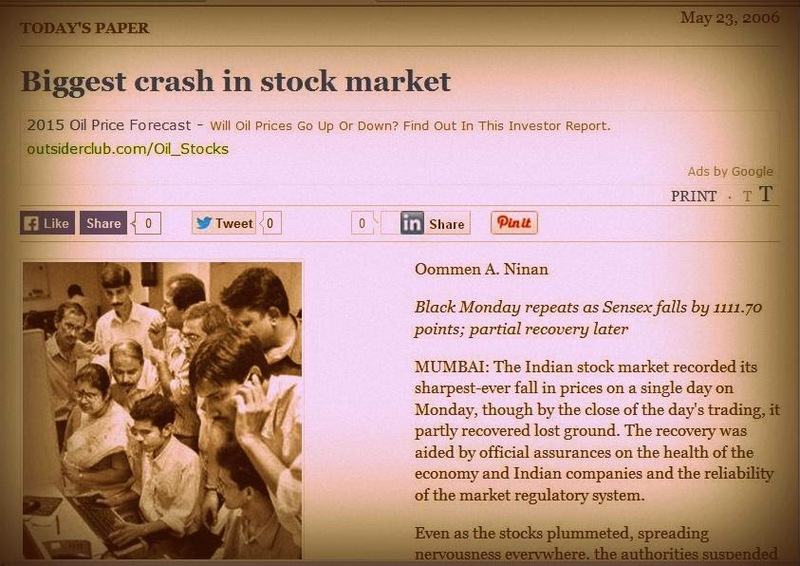 March 17, 2008: Sensex falls 951 points. March 3, 2008: Sensex falls 901 points. January 21, 2008: Sensex falls 1408 points. January 22, 2008: Sensex falls 875 points after intra-day fall of 2273 points. May 18, 2006: Sensex falls 826 points. December 17, 2007: Sensex falls 769 points. October 10, 2008: Sensex falls 801 points. October 18, 2007: Sensex falls 717 points. January 18, 2008: Sensex falls 687 points. November 21, 2007: Sensex falls 678 points. August 16, 2007: Sensex falls 643 points. April 2, 2007: Sensex falls 617 points. August 1, 2007: Sensex falls 615 points. So…do you remember all these dates and falls today? And can you make out those big crashes in the NAV chart of a good well-diversified mutual fund like HDFC Equity fund? 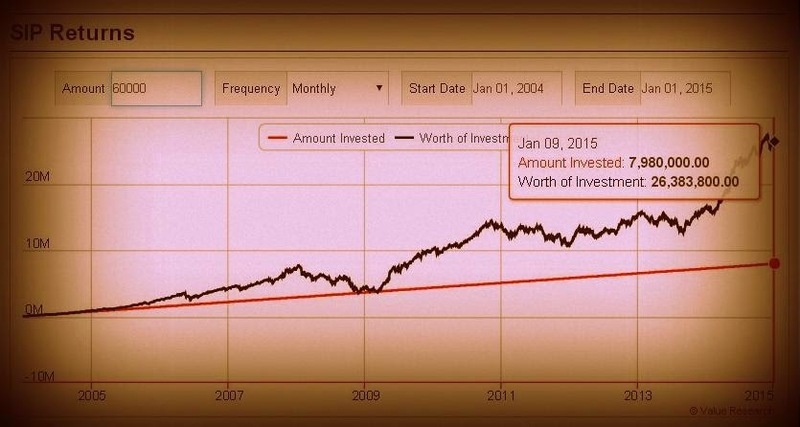 Index value on 1st Jan 2008 was 6144 – A peak value for the index at that point of time. At the same time, NAV of HDFC Equity fund was 224. Index value on 1st Oct 2010 was 6143 and NAV of HDFC Equity fund was 300. So…after all the corrections in between 2008-2010, the markets recovered back to the same peak index level nearly after 2 years and 10 months. And even if you had invested at the peak valuations (of index) in HDFC Equity fund in Jan 2008 in lump sum mode, the fund would still have provided you with Rs 76 (300-224) gain per unit – and that is when index did not move anywhere at all. It generally pays to stay invested in a good quality, actively managed equity fund. Index value on 1st Oct 2010 was 6143. And NAV of HDFC Equity fund was 300. After all the corrections the market recovered back to the same peak index level nearly after 2 years 10 months. Index value on 1st Jan 2014 was 6301 and NAV of HDFC Equity fund was 304. Again after corrections, the market recovered back to the same peak index level after nearly 3 years and 2 months. Lesson 3 above was proven wrong. 🙂 Always remember, not all rules are applicable and proven, at all times. The above post and Part 1 of the same post-series should not be considered as any sort of recommendation or investment advise. These posts are not to be considered as advise to invest in HDFC Funds or any other funds named in both parts of these posts. HDFC equity fund was one of the core fund of my portfolio along with several other funds. However for simplicity of the post, all investments have been shown as invested in HDFC Equity. There were some funds performing better than HDFC Equity in my portfolio and some were lagging the performance also. The fund in general was used as an example. I thank Dev for guiding and encouraging me to write a post on Stable Investor. Next Entry Thoughts – Money Linked Mindlessness, Valuations, False Hopes! Amazing journey. Congratulations. Thanks for sharing this journey. I learned so many good things. Thanks Dev as well. Sharing our personal finance details are very rare you did it sir and its very very useful to me. Thanks a lot. All the credit goes to Ajay for sharing his experiences and learnings with me and all of us. Really learnt a lot about simplifying the approach towards mutual fund investing. Absolutely agree with you Madhu. Really one of the best article i came across. Terrific post and the best I have read till date. I have been investing from 2006 onwrds and majorly in Mutual funds. My goals even today are more than 15 years later. I never cared for Nifty p/e value. But as per you article you seem to convey that when p/e >23 we should restrict. Thanks to Ajay for sharing his experience and Dev for providing him an opportunity. 1)This whole thing as happened as of write up when the market is on bull run and allows us to see the opportunity it allows for individual investor if it had the rigor to stick to our plan initially and gives hopes that it is indeed possible for anyone with right approach(Personalized story over statistics given in newspapers makes more impact, as Kahneman says). 2) Very few Indian success stories written and shared in Indian specific context. Again gives more hope to stick to plan. 3) The sum invested (60k)is something somewhat average rich people in middle of their career(with increasing income, people in this category will only increase) can invest comfortably and for somewhat less-moneyed people class people to look at it and aspire to learn to reach that level and see the fruits being borne(although i wish if there is another post from a person who invested 20k-30k, it will again be more beneficial in terms of inspiration of this latter class). Coming to the posted specific question, you have to look at which part of the investment cycle you are in your investment target (not only the goal). If you are just beginning it is waste of time to look at all this, just keep investing. Lets say you planned to invest 2crore targeting a amount of 5crores in next 15years and so far you have invested just 40Lacs and the portfolio value is currently 80Lacs and at this point your Equity Debt ratio drifted from orginal 70:30 to 85:15 and the PE ratio is 23. In this case, you may continue with your minimum SIP amount and keep the excess investment amount in debt and wait for better entry points to invest say a PE of 18 to 20. But stick to minimum SIP investment amount as per orginal plan. Now coming to adjusting the asset allocation either you can adjust the asset allocation to 70:30, if the drift has happened due to substantial profits and the profit booking amount is significant. If the profit amount is insignificant then considering the debt is also providing decent returns now, you can invest in debt directly and increase the debt allocation without selling equity. By doing this, If there is a correction you can shift cash from debt easily, if the market continue to move higher without providing a correction, still your portfolio will continue do well. This will give you more comfort. Do check out whether the drift is due to real profits or is it also due to your increased contribution towards equity, like if you have 50Lcas with 70:30 and you invest another 10 Lacs in equity in a short time then the asset allocation is drifted by additional funds and not really due to market surge, in this case there is no point adjusting your asset allcoation. Personally, since my investment target is reached, I am currently investing in debt without doing any further investment in equity and waiting for better entry points to invest in equity. I do see review my plan regularly (on yearly basis) and to reach my goal, I have targets/mile stones to reach every year. If this mile stone amount has substantially breached my target/mile stone and if the market PE value is very high, then I do sell to bring the target value amout to the desired amount and shift the profit amount to debt and wait to reinvest or start investing it in debt to wait for better entry points in equity. These are personal choices and there is no one fixed rule to play. If you are really serious about 15years and not bothered about anything just invest in equity no need to look at anywhere else not even asset allocation. But be prepared to accept negative returns for some period in this 15year term. Hope above clarify your doubt. Thanks Mandhu for those encouraging words and I do thank Dev for enouraging me to write this post. Regarding your suggestion for another post for 20-30K, yes if any of the reader would like to post his experience that will be good. Even otherwise to me 60K or 20K do not matter. As 60K person I have my set of goals and aspirations and equally the 20K person will have his own. It is more about the path, discipline and patience that matters most than the amount itself. It is not about 20K or 60K but it is generating a 18% P.A returns on the invested amount over a very long term that will make the difference and that should be our prime target. I do think by discipline and patience one can easily do that. Came across your post accidentally. Written with honesty, openness and with an intention to share with fellow friends. I am sure the initial part of your journey resembles with many (At least for me. Ended up in buying 2-3 insurance policies just because of agents). If you can share, some information on “How did you end up choosing a fund (considering any morning star / valuereasearchonline ratings or something else” and also “What are the factors you looked for..when drifting away from one fund to the another” would be of immense value addition. Otherwise, wish you all the best. VR / MS ratings (as a starting point only), performance comparison on yearly basis + bull and bear periods, fund manager, a look at portfolio, fund house reputation, some ratios compared to other funds, fund expense ratio, turnover ratio and so on. Hi ajay, very nice article. I am new to Mutual funds, just started reading about it as i want to invest. Also, i am a regular office going person, as you mentioned for people like me just pay SIP. Can you elaborate on this? How i will prepare my portfolio. How can i decide which fund to pick. What ratio of equity debts will be going for people like me having average risk appetite. Effectively 1.44 crore Is 2.5X in 10 years. If we calculate the value of the property around 1 Crore purchased in 2005 (independ 4 BHK bungalow) and author paid 1.44 crore out of which 44 Lakhs as an interest then the property would have been worth minimum 5 crore in 2014. Great write up, But its really a tough way to achieve same goal which one can achieve via simplicity. Not everyone can do such financial gymnastic.